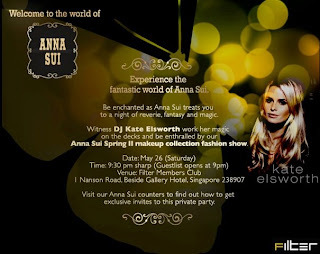 Anna Sui is throwing a Private Party on May 26, 9pm at Filter Members Club. 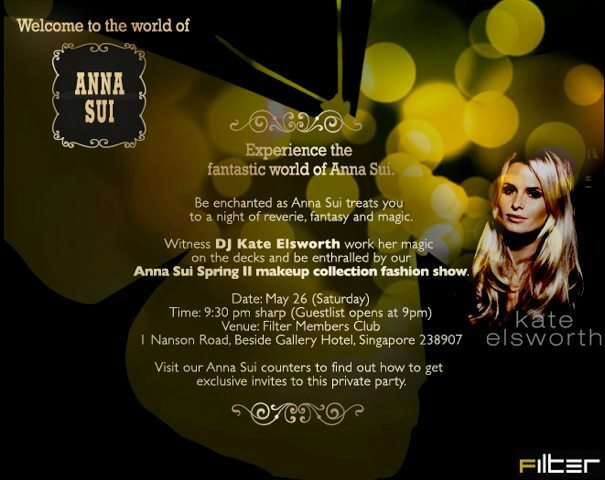 I'm not an Anna Sui fan so didn't reach out to find out more details. But interested girls can always visit any Anna Sui counter to join the party. The long waited Shiseido Private Sale is coming tomorrow. May 16-17, 10am-8pm, Orchard Building #12-01, time to stock up! Haul Update: I was among the first batch who entered the sale. Most of the sale items were makeups and no skincare starter/deluxe sample kits available this time for CPB and Shiseido, but individual skincare full size items are available yet running fast. I grabbed CPB cream foundation (all shades were available) at $60, CPB palette vintage II (both I and II were available but expiry data for I is 2014, while II is 2015) at $80, CPB single eye shadow #112 (only one colour available and no palette, and left only a few then) at $25, Shiseido Collector's Edition Makeup Palette at $30 (this is totally a steal), Maquillage Eye Creater 3D #PK766 (only 2 palettes available, the other one is a purple tone) at $25. Wanted to get some CPB lippies and loose powders but they were not on sale. Basically for CPB makeups, they only offer foundations. While you could expect a lot more from Shiseido and MQ. Beauty.com Friends & Family event is happening now. Get 20% off sitewide except some brands like Fresh. No code needed but you need to enter through the link. Valid thru May 18. Beauty Sak offers free shipping and 15% off any $65 purchase. Enter code MAY200 at checkout. Valid thru May 20. Benefit offers free Velvet Eyeshadow in tickled milk with any $60 purchase. Enter code TICKLED at checkout. Or receive a free Creaseless Cream Eyeshadow/Liner in Strut with any $60 purchase. Enter code STRUTUP at checkout. Both codes valid thru May 22. BirchBox offers free BaubleBar Braided Bracelet with any $75 purchase. Enter code maybauble at checkout. While supplies last. Bobbi Brown offers free shipping and deluxe sample of Extreme Party Mascara and Crystal Lip Gloss with any purchase. Enter code NEW512 at checkout. Valid thru May 18. Caswell Massey offers a free sample of Almond & Aloe Hand and Body Emulsion with any purchase. No code needed. Valid thru Jun 15. Clinique offers extra treat on top of their 7-pc bonus. Top up your purchase to $50 to receive free shipping and an extra deluxe sample. Enter code UPGRADE at checkout. While supplies last. Dermstore offers SmartLash Eyelash Enhancer for $29.95 (usual price $125). Plus receive free 1-3 day shipping and a free mystery gift with your purchase. No code needed. Valid thru May 31. Folica.com offers 20% off all hair care products. Enter code SPRING20 at checkout. Valid thru May 16. Fresh offers a free mini Sugar Rose with any $100 purchase. Enter code ROSE at checkout. Valid thru May 17. Juice Beauty offers free shipping and deluxe Stem Cellular Repair Eye Treatment 10ml with any $50 purchase. Enter code STEMS at checkout. Valid thru May 18 3am. La Mer offers free shipping an a sample of the Radiant Serum with any purchase. Enter code SEASON at checkout. Valid thru May 20. Perfume.com offers 10% off any purchase. Enter code Sorry at checkout. Valid thru May 21. Sephora offers a free 2-week supply of Caudalie new Vinosource SOS Thirst Quenching Serum with any $25 purchase. Enter code SOSSERUM at checkout. While supplies last. SpaLook offers 20% off any Obagi products. No code needed. Valid thru May 21. Yves Rocher offers 2 Shower Gels for $6. Choose any 2 out of 15. No code needed. Valid thru May 28.